** Be sure to check out the Mail guidelines under “Important Info” section before sending a package to your missionary! Remember ONLY packages sent via Priority Mail can be forwarded to your missionary. All other packages are kept in the mission office until someone travels to his/her area! Healthy Snacks like nuts, dried fruit, beef jerky, etc. There is so much joy to be had in the support of a missionary! Whether you are the mother of an elder, a sister, or the daughter of a missionary couple, your family can enjoy being a part of their mission through letters, emails, mail, packages and activities at home! Pick one and have fun! Vacuum pack favorite simple recipes that will give them a taste of home to share with their district or companion. Send highlighters for them to give to new members or investigators to use for their scripture study. Send familiar toothpaste, deodorant, a toothbrush or make-up for girls. Send pictures of the Savior for them to give to families who may not have access to the distribution center. Stickers of the Savior are a great way to share with the branch or ward as well. Send CTR rings for them to give to the young children. Send small photo albums (plastic ones that hold 20 or so photos) so they can keep their photo’s safe, or leave a favorite photo or two with a newly baptized member or investigator. There are some internet companies that you can upload pictures and memories to, and then have them bound. This makes a wonderful gift for a missionary teaching about families! Buy a small notebook or nice journal for them to gather the testimonies of companions or members. Make bookmarks with Christ’s picture and a scripture that they can slip inside a Book of Mormon they will give away. Send drink mixes (sugarless are cheaper in freight) to missions where the water is not very tasty. We recently sent root beer extract to my son to make a big batch of root beer. Photocopy talks that you or your children give and send them. I try to punch mine with a 3 hole punch so he can slip them in a binder. Send silly photos from home that will make your missionary laugh. At Conference time, have all of your family write their testimonies and send them in a big envelope. Tell your missionary how grateful you are that he/she is sharing the happy news of the gospel. At Christmas, send your missionary a favorite memory of him/her from every member of the family. Create a theme and send a package. We recently sent my son a “We’re nuts about you” package. We filled it with peanut butter, salted nut rolls, pistachios (his favorite) and Snickers! Make creating a package your FHE activity. Save change in a jar and then take the family shopping to find things that each family member has chosen as something your missionary needs, could share, or give away! Having my missionary send back his photos on a burned CD is a great way to get photos home. That way he has the originals with him and I get a copy. I like to send hand warmers to my son during the very cold winter! Send a favorite Conference talk. I send small quantities of familiar medicine to my missionary, as he is not sure of standards in his country. Send new, appropriate and mission approved music. Make a tape and create a song about his mission using an old tune with new words. It’s fun for them to hear your voice. We like to leave a spot for him in any family photos we take while he is away. Create a blog for your close family and friends to keep track of your missionary. Send cinnamon candies or mints. Missionaries usually are asked to refrain from chewing gum. Remember that it doesn’t matter what you send, it all spells love from home! The best things come in ANY package. Make sure you know if what you are sending could be purchased cheaper there. Make posters with notes of encouragement and take a photo with all of you holding a different poster, like a cheering section! Peanut butter or beef jerky are great sources of protein for a mission with little meat. Make an “Encouragement Book” for your missionary before he/she leaves on his/her mission. Fill it with encouraging thoughts, poems, scriptures, pictures and letters. This can become a great reminder of the importance of the work they are doing. Cereal is lightweight to send as well. Make Rice Crispy Treats the size of the cereal box and repackage it in the box the cereal came in. This was a favorite for the MTC time. Favorite candy is always a hit. Break open the bag to fit them down in all the little spaces! Let the spirit direct you and have fun! It’s been interesting to have my son mention in a letter something that he feels he needs or would add to English classes and it’s already in the mail! 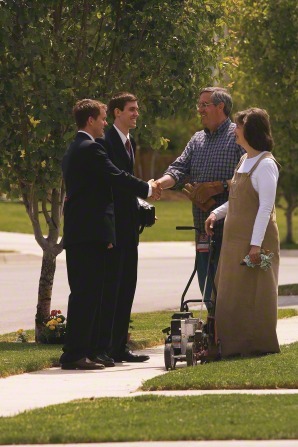 Be sure to know the mission rules for your missionary regarding mail and packages. Remember to be respectful and obedient. Be mindful of the weather. Don’t send chocolate in the heat of the summer. How about Oreo’s? Use marshmallows in Ziploc bags as packing peanuts. Unbuttered popcorn in bags works well too! Write wonderful inspiring notes all over the inside of the box you are sending. New socks are always appreciated. They also make great packing material! Putting a box on my dryer reminds me it’s time to get a package together. Over the next few weeks I will pick up little things at the grocery store that my missionary cannot get where he is at. Then the box moves to the table where we get serious about filling each little space. Finally it makes its way to the counter where I know it’s time to send it out. In some countries, if you put a picture of Jesus on the package, it seems to be bothered less. Stickers or pass-along cards work great. Choose a sturdy box. Fill it as full as possible so that it doesn’t rattle! Don’t forget a letter inside, that’s the most important thing you are sending! We’ve had the best luck when we tightly tape the box shut, wrap it in brown paper, and then tape the entire box with sturdy tape before labeling it! Always remember your missionary’s companion. Not every missionary has great support from home. A small gift and a note could really make a difference. Be organized and send your packages for Christmas well in advance. Ask the mission home if they know of a reliable company that delivers packages. There are a few independent companies that seem to do a good job getting packages into tougher countries. Become aware of customs fees for your missionary to receive a package. Make a bulletin board with a map, photos, mission call, leadership, mission scripture etc., and hang it in a prominent place. Post new emails there so the family knows where to find it. Keep this up in your home until your missionary is married to always remind them of their mission. Study the same scriptures they are studying so that you can exchange thoughts. If your missionary is lucky enough to have a temple in their mission, attend your temple on the same day as your missionary! Create clever subject lines from scriptures or music in your emails. Send a favorite scripture at the bottom of your letter. We read our missionary’s email on Monday mornings for scripture study! Boy do my kids get out of bed quick on Mondays! Create a chain letter with your missionary’s friends. Once a month I receive about 12 letters that moms have forwarded to me and I print them and send them off to my son. Pray specifically for your missionary in prayers with your family. Have your missionary send home a map of the city they are in and circle where they live, where they attend church, where their investigators are, etc. Put a clock on the wall and set it to the time zone that your missionary is in. Make your fast Sundays specific to your missionary. Hang a flag from your missionary’s mission somewhere in your home. Learn to cook a local favorite of your missionary and share it with your family. Challenge children to memorize scriptures that your missionary refers to. Encourage your missionary to exchange ties with each companion so that he has a memorable collection when he is home. Create a special binder for your missionary that has a copy of his/her patriarchal blessing, line of authority, a 4-generation group sheet, thoughts about his/her setting apart, his/her mission call, and any other great things you think of! Celebrate your missionary’s birthday even though he/she is away. Create a binder of all their letters and photos and give it to them when they get home. This is great for younger siblings to look through. Have many FHE’s where you learn about a place in your missionary’s mission. Take paper and pens to family reunions and have the extended family jot down a note. This works well if you send voice tapes as well. Often, around the dinner table when you are having a great discussion on any topic, ask “What do you think “(missionary)” would have to say about this? Take on small money-making projects where the whole family can help earn money and let them know that they are helping to support their missionary. If your missionary is in the US, buy a few photo stamps of him. These are a fun way to use a photo of your missionary as postage. Be uplifting! Share personal stories of your life that uplift, or make him/her laugh. Be careful to not share things that will worry your missionary unnecessarily. Be consistent in your letter writing or emailing. No news is NOT good news. Send an easy-to-answer questionnaire to you missionary with all the simple things you want to know about. Use FHE to write letters or emails to your missionary. I encourage my 9- year-old to use emailing his brother as his keyboarding homework! Even if you mainly use email, now and then write a handwritten letter. Always let him/her know how proud you are of them. Send a letter filled with favorites scriptures. Postcards are a fun and easy way to send a quick thought to a missionary. Take the time to really ponder about your missionary and write a heartfelt, inspired letter. Set aside a specific time to write to your missionary so that you don’t miss an opportunity to be supportive. Having a specific time to write really helps. Email yourself everyday with ideas from the day so that when you get to the day you write, you already have all your great ideas gathered! Write a note to a companion, telling him/her what a difference they have made for your missionary. Because there is a special need. It will surely make everyone feel better. Our missionaries will feel despair. Will support our missionaries to the end. With a letter or package we send today. Some items may be less expensive to purchase in the mission. Doing this will also help avoid theft and customs fees. Missionaries must pack everything they own into two suitcases for transfers. Bulky items may be thrown away or left behind. Record your testimony and send it to your missionary. Don’t send books. Missionaries have the Church basics they need. Extra books are not approved and add weight to their already full suitcases. Don’t send toys or games. Missionaries have plenty to do on their preparation days. Don’t send cash through the mail. It is illegal to send cash internationally. Even within your own country’s borders, cash is often lost in transit.